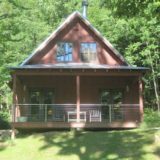 This cabin is 50 yards from the Maury River. The cabin offers serene views upstream and downstream. Sleeps 7. $285-$265. Children Welcome, Pets Welcome, Smoke-Free Property.